The 2-day Risk-Based Policing Leadership Course teaches public safety professionals the key elements of Risk-Based Policing and how to adopt this evidence-based framework for crime prevention and risk reduction in their jurisdiction. FROM THE BOOK COVER: Risk-based policing is the latest advancement in the long history of policing innovations, where research and planning have combined to manage crime risks, prevent crime, and enhance public safety. In Risk-Based Policing the authors share case studies from different agencies to demonstrate how focusing police resources at risky places, based on smart uses of data and strong analytical work, can address the worst effects of disorder and crime while improving public safety and community relations. Topics include the role of big data; the evolution of modern policing; dealing with high-risk targets; designing, implementing, and evaluating risk-based policing strategies; and the role of multiple stakeholders in risk-based policing. Case studies explore cities such as Colorado Springs, Glendale, Newark, Kansas City, and others. The book also demonstrates how Risk Terrain Modeling can be extended to offer a more comprehensive view of prevention and deterrence. Risk-based policing is the mindset and operational practice of reducing and managing crime risks. Risk-based policing enables police departments to be appropriately credited with success and judged against the probable consequences of alternative or non-existent engagements in the communities they serve and protect. Watch the Atlantic City Police on National Geographic Channel's 'Breakthrough' series, Season 2, Episode 5. "By finding hidden patterns in big data, computers powered by a new form of artificial intelligence can predict the future with amazing accuracy." Policing encompasses a wide range of activities carried out by police officers to control the affairs of a community, especially with respect to maintenance of order, law, health, safety, and other matters affecting public welfare. Law enforcement is a key function of policing, but refers specifically to enforcing the written rules governing society by discovering, deterring, stopping, and/or seizing people who violate the law. Public safety refers more broadly to the general welfare and protection of the public from various dangers affecting persons, property, and collective well-being. Policing and law enforcement affect public safety. These distinctions among policing, law enforcement, and public safety are important for understanding the missions of modern police agencies and the 5 central tenets of Risk-Based Policing. 1) Focus on places, not only people, to prevent crime. 2) Develop spatial risk narratives. 3) Solicit and value input, from all ranks of police personnel and other community stakeholders, about situational crime contexts, data management, expected outcomes, and performance measures. 4) Make data-driven decisions following a transparent process of problem definition, information gathering and analysis. Crime is a complex issue, and crime problems require more than only policing and law enforcement tactics to be adequately solved. Crime solutions need a strategy for sustainable success. Whether your municipality is large or small, its crime prevention strategy needs to be bigger than any single tactic. Tactics should not dictate strategies. Strategies guide tactics. For example, violence reduction strategies need to involve police and other community stakeholders, and coordinate their resources and tactics at the right times and places. While tactics may be targeted and temporarily deployed, strategies are long-term and sustainable. Data-informed community engagement (DICE) is a framework and process for crime prevention and public safety. DICE uses 'RTM' and the 'ACTION agenda' to diagnose crime problems, form risk narratives, and develop place-based strategies to disrupt the narratives with coordinated responses by multiple stakeholders and resources. 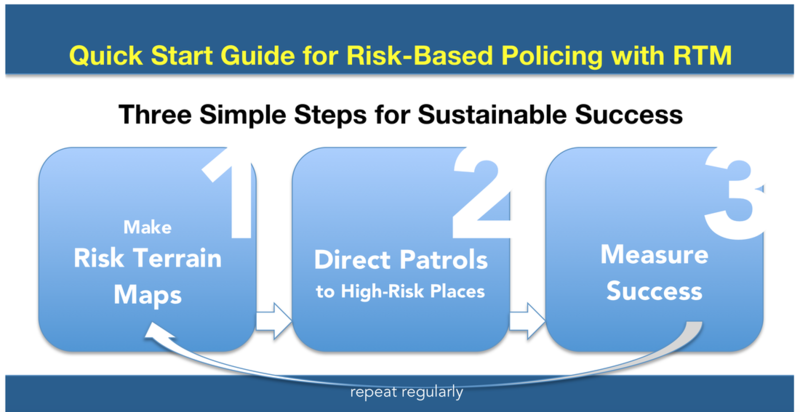 Risk-Based Policing (RBP) was adapted from DICE to offer police departments an evidence-based crime prevention strategy they can lead. RBP fits within a municipality's larger set of DICE strategies to address non-crime issues that also impact public safety and security (e.g. education, employment, poverty, economic development, etc.). Risk-Based Policing and DICE strategies share the burden of crime prevention and public safety among several stakeholders who deliver a variety of resources, in coordinated fashion, to places that need them most. Police actions have an important role to play in affecting crime risks. They can deter offenders, embolden victims, and assist in the hardening of targets. These products can have the overall impact of reducing crime occurrence. But we must separate what we would see as crime prevention tactics from risk reduction strategies. ​A risk reduction strategy requires that police identify the environmental conditions in which crime is likely to appear. This diagnosis can be ascertained from risk terrain modeling. Then police can propose strategies to address these conditions and disrupt the interactions that lead to illegal behavior settings and new crimes. Policing and law enforcement tactics focused on people at crime hot spots may have the effect of deterring criminals or even reducing crime counts at these areas in the short-term. But, despite this, the underlying spatial factors that attract and generate problems in these areas do not go away. So, three things can happen: crime disappears, it displaces, or it subsides to reemerge later. This burdens police departments in pursuit of the mission to prevent crime with sustained oomph. Malcolm Sparrow explains that reported crime rates will always be important indicators for police departments. But a sole reliance on the metric of crime reduction would “utterly fail” (p. 5) to reflect the very best performance in crime control practices when police actions are successful at keeping crime rates low and nipping emerging crime problems as they bud. ​Beyond looking at crime rate changes, a risk reduction strategy offers measures of success beyond merely crime counts improving. Risk reduction strategies have dual objectives: One to reduce crime counts and the other to reduce the influences of known risk factors. Risk-based policing allows police leaders to demonstrate to elected officials and budget-makers how what police are doing works to reduce crime and why the crime rates are lower because of their efforts. RBP strategies extend beyond a focus on opportunities for crime or the “crime triangle”, and, instead, target all aspects of the context that raises the risk that crime will occur. This opens the door to a broad array of police productivity and success measures that do not demand the illegal behaviors and crimes to continue in order for police to justify their value to achieving public safety. Risk terrain modeling provides an approach to understanding crime occurrence by identifying the relative influences of factors that contribute to it; risk terrain maps inform decisions about which places can be targeted to reduce these risks. This is inherent in risk-based policing, which considers contextually dynamic risk narratives. Iterative risk terrain models and reconsiderations of risk narratives make risk reduction strategies and tactics transparent, measurable and testable. In this way, risk-based policing enables police departments to be appropriately credited with success and judged against the probable consequences of alternative or non-existent engagements in the communities they serve. ​Recent uses of risk terrain modeling in various practical settings suggest that police departments are able to incorporate risk management into their analytical and cultural frameworks with real success. More departments should follow their lead, and city councils should support their efforts. Cultural shifts within police departments away from ‘crime fighting’ and toward ‘risk management’ costs very little financially. Coupled with sustainable investments in crime analysts and data, RBP can go a long way to help agencies prevent crime, and then to credit their actions with success in a way that is obviously clear and sustainable.